01.22.19 19:29	Account	Transfer	-65.00	Sent Payment: 65.00 USD to account U17215104 from U18691***. Batch: 243595906. Memo: Shopping Cart Payment. Мой мониторинг HYIP проектов: www.hyip.center Максимальный рефбек! 01.24.19 22:57	Account	Receive	+1.3	Received Payment 1.3 USD from account U17215104 to account U18691***. Batch: 243835673. Memo: API Payment. Payment_to_hyipcenter. 01.25.19 21:40	Account	Receive	+0.65	Received Payment 0.65 USD from account U17215104 to account U18691***. Batch: 243935417. Memo: API Payment. Payment_to_hyipcenter. 01.27.19 11:29	Account	Receive	+0.65	Received Payment 0.65 USD from account U17215104 to account U18691***. Batch: 244073421. Memo: API Payment. Payment_to_hyipcenter. 01.28.19 10:10	Account	Receive	+0.65	Received Payment 0.65 USD from account U17215104 to account U18691***. Batch: 244169079. Memo: API Payment. Payment_to_hyipcenter. 01.29.19 07:12	Account	Receive	+0.65	Received Payment 0.65 USD from account U17215104 to account U18691***. Batch: 244268824. Memo: API Payment. Payment_to_hyipcenter. 01.31.19 16:23	Account	Receive	+0.65	Received Payment 0.65 USD from account U17215104 to account U18691***. Batch: 244571245. Memo: API Payment. Payment_to_hyipcenter. 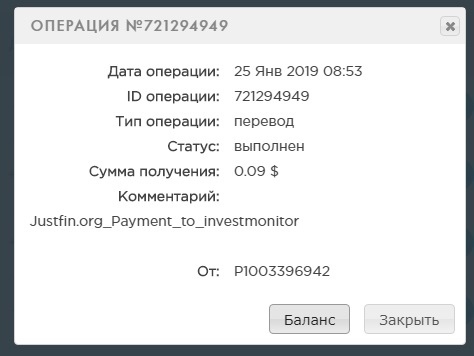 02.01.19 17:58	Account	Receive	+0.65	Received Payment 0.65 USD from account U17215104 to account U18691***. Batch: 245040213. Memo: API Payment. Payment_to_hyipcenter.